Let's Talk ... Sauces, Dips, Gravies Etc. we used sauciers in cooking school. i prefer my plain 'ol clad. or cast iron. a talented person makes a far better sauce than a pan. Since you STILL have to use a pot or pan anyway, it IS the pot or pan that you use that makes the difference. I used to use my large cast iron skillet, still do at times, but there is always the chance that the unmixed roux ends up hiding at the bottom in the corner of the pan. Only finding this out after taking the rest of the gravy out of the pan to store in the fridge! i listened to my Chef advisors. they know. & when I'm thorough, my roux is excellent in cast iron- attend to those edges. Last edited by luvs; 08-14-2014 at 12:57 PM. Well, go with your theories. I'm done. they're not theory-- they're proven by, once in awhile, master Chefs. that i've personally met. not to mention my Chef instructors, & trained employers. Last edited by luvs; 08-15-2014 at 03:09 AM. FYI, I have worked with master chefs just about all of my working career. I worked with a master chef and a pastry chef in culinary arts training course. You've got some nerve asking me that. So please do not question my credentials. I go on MY experience, you go on yours. Done. Luvs - Have you ever made the Greek lemon and egg sauce/soup? If so, any pointers? Have you ever tasted of it? If so, what did you think? Sherman - I didn't know that you have had culinary training. Same questions for you too. I do have one of the all clad sauce pans and I hate it. The handle is to long and heavy so the pot tips over and spills whatever is in it all over the stove. Sorry but these are my experiences I don't want to step on anyone's toes. sigh. let me count the ways so many pots and pans are designed and named . . . .
for what reason I'm not all too sure. there be pots specifically "labeled" as 'saucier' - they typically have a rounded bottom chine/corner/whatever-you-want-to-call-that-part-of-the-pot/pan. the kitchen rumor has it they are so designed such that using a whisk can "reach into the corners" - this is certainly a reasonable truth, subject to "sizes of geometry"
I also have straight sided pots / casseroles - and I also have wooden paddle type doohickies that will clean out the corners, no problemo. a whisk, a wood thingie, a loaf of bread, a chunk of cheese, a bottle of vino. I'm happy and it all works. I have also an "evasee" - big hunking deep pan with rounded corners and sloped sides. does a super job as a 'faux wok' and for southern fried chicken. abandon ye all snobby terms who enter the kitchen and go with what works for you. You're not stepping on anyone's toes. Luvs had questioned my credentials, and I don't take too kindly to that. She insulted me by doing that! Seems that every time that I start a thread or comment in one, she has to argue with me and seemingly wants to start a fight! We are supposed to be good people here, and I do not come here to fight with anyone. the problem is, you've not made notice of your credentials. I joined in 2009. never had an inkling you had any professional experience. otoh, luvs frequently mentions cooking professionally and all the schufft she hmmm, errr, 'enjoys' about that. methinks you've overreached the insult part. i know we made a soup of that type, cooksie. we've also ordered similar soup. details to follow- i hafta get pretty fer my friend. slap a layer of liptint on & pull my hair into a fashion. Last edited by luvs; 08-15-2014 at 07:30 PM. I HAVE cook professionally for several catering companies. I was a cook for United Airlines, I've cooked at many restaurants during my professional career. I've also worked in a bakery where I've filled fruit filling into danish before they were baked, anf I've frosted cakes as my job assignment. I should not have to explain what exactly I did during my working career. My word should be enough. She made it appear as though I was lying, sensationalizing or generalizing, and I don't lie about what I did for a living. My only shortcoming is that I was being insulted & ridiculed. Should not be allowed to happen. I would not have posted that post had this not occured. If this happens again, I will put her on my ignored list. And BTW, I DID successfully complete the culinary arts course, received a certificate of accomplishment, took the ServeSafe test, completed that as well and became ServeSafe certified. Last edited by Shermie; 08-18-2014 at 08:44 AM. Re: Let's Talk ... Sauces, Dips, Gravies Etc. These may not count because they're bottled sauces. 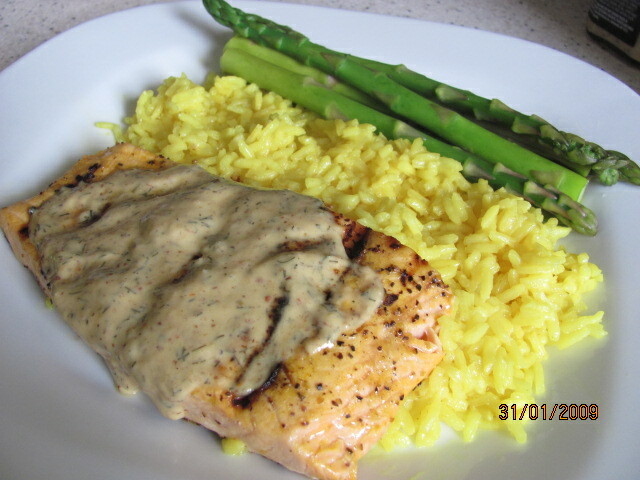 I bought some Lemon Dill Caper Finishing Sauce that I'm going to try on Salmon. It looks really good, kind of like a hollandaise or bearnaise base. Also bought some Great Value Boom Boom Sauce that I'll try on shrimp. I think the Boom Boom sauce is their answer to Bang Bang sauce...won't know until I try it. I tried the Boom Boom sauce on fish tacos and really liked it. I'm pretty sure it's too hot for you, Q-Sis. If I remember correctly, you can't even do mild Rotel, so it's probably a big no-go for you. Right you are, Cooksie! Thanks for the report (and warning!). Copycat Bang Bang Sauce is just mayo blended with sweet Thai chili sauce, and sriracha (or other hot sauce) added to taste. If you like the flavor profile, you could just dial back on the sriracha. I follow this site on Facebook. That actually sounds great, Moxie, and I have all that stuff - thanks! It tasted like pure mustard. I should have read the ingredients as the first one listed is a raspberry mustard...yuck . Don't know what's wrong with my camera. I tried to re-set the date, but it still shows some way back date...oh well .